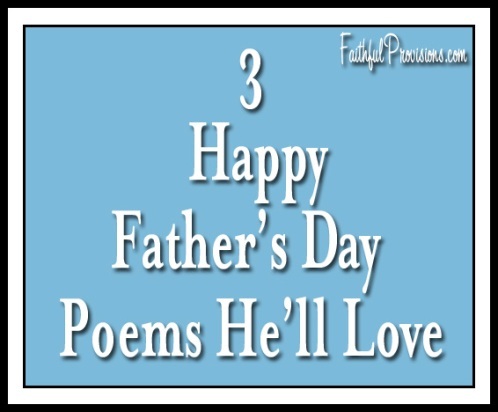 These happy Father’s Day poems will fit the space on a card, bookmark, or scrapbook page. Not too long, but they still say so much. “A Daddy Like You” is a great little Father’s Day poem that would be perfect for a new dad. So precious! I think “Dad’s Words of Wisdom” would be great for anyone to give their dad. It really rings true, like all inspirational Father’s Day poems. And the last one in this post, “When Daddy Gets Home” describes a typical day at the Hancock house perfectly. I think I might use that one for Bradford’s card. love that baby a lot! has a daddy like you. You knew all the answers. You were always so generous. You taught me the value of solitude. You taught me to plan for the future. And you always shared your feelings. :: Find more funny poems for Father’s Day HERE. Hear the screams and shouts? See all the kids come running out? A super hero with super powers. I love free Father’s Day poems, like this one written by the great Christian poet Helen Steiner Rice. It’s perfect for a sentimental Father’s Day card, note, or letter. the third one is awesome, i might use it for father’s day!!!!!!!!!!!! !